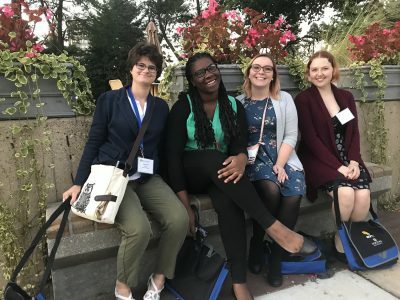 Four student tutors from Stetson University’s Writing Center presented their research at a national conference in New York this semester, developing a guide with strategies to better accommodate students with reading disabilities who want help with their writing. Left to right: Katie Howell, a senior English & Religious Studies major; Vanessa Petion, a senior Communication and Media Studies major; Jeanette Jakupca, a junior English major; and Kitty Geoghan, senior Digital Arts & Psychology major, enjoy a break at the national conference in October. Reading and writing go hand in hand, as the experts say, and the four tutors wanted to explore how to best help these students during sessions at the Stetson Writing Center in duPont-Ball Library. Seniors Vanessa Petion, Katie Howell and Kitty Geoghan, and junior Jeanette Jakupca gave their panel presentation on “Building the Bridge Between Accommodation and Tutoring: Reading Disability in the Writing Center” at this year’s National Conference on Peer Tutoring in Writing. As part of the research, the four tutors interviewed Stetson students about their experience with accessibilities and the Writing Center, and created a guide with different strategies that tutors can use during their sessions — not to diagnose students with a disability, but to better accommodate them. Geoghan’s poster presentation was titled, “Understanding Deaf Writers: Linguistic Differences between Standard English and American Sign Language,” and examined the intersections found in tutoring writers whose first language is American Sign Language and writers whose first language is not English (ESL). After synthesizing this research, she presented strategies that tutors can use to better accommodate deaf writers. Both presentations had a wonderful reception at the NCPTW conference with discussions about the topic. Tutors and directors from universities across the country asked for handouts and the PowerPoints from the tutors’ presentations to use in their own centers. 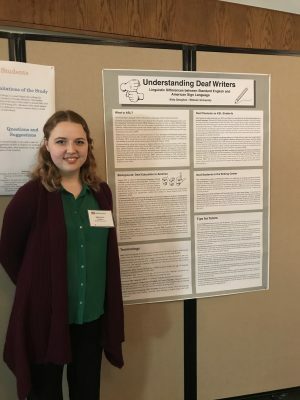 Kitty Geoghan stands with her poster presentation, “Understanding Deaf Writers: Linguistic Differences between Standard English and American Sign Language” at the national conference in New York. These research projects have been implemented in Stetson’s own Writing Center, with more accommodations being available as well as a step toward integrating Accessibilities Services within the center. The Writing Center now allows service animals in the space and offers assistive technology as well as extended time for sessions. Not only does this research impact Stetson’s Writing Center, but also it adds to the conversation in Writing Center research about accessibility and accommodation services. On a heuristic level, the act of putting together a research project and presenting it was a larger conversation being discussed at the conference — the significance of undergraduate research. The conference’s keynote speakers were the director of the Writing Center and a professor at the University of Delaware, Melissa Ianetta, and the director of the Wilf Campus Writing Center and professor of English at Yeshiva University, Lauren Fitzgerald. They spoke on the relevance of undergraduate research being done in the writing center. They noted that this type of research was more prevalent than graduate and faculty research because it relates to the everyday issues and experiences of writing center tutors. That is to say, the undergraduate research comes from specific experiences as an undergraduate and therefore pertains more closely to peers who are having similar experiences. Students in the course, English 324: Peer Tutoring in Writing, which is the prerequisite to become a Stetson tutor and fellow, are required to complete a research project that can be published in scholarly journals or presented at academic conferences. 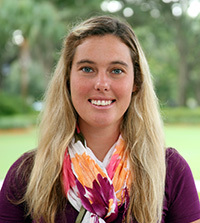 Dunning, who teaches the course, asks students to investigate a central question related to their experience as a fellow or tutor in training.